The latest pic from her Facebook/Instagram - will she shed out to be dark like mom and dad or will she stay this lighter bay? Wow, she's adorable and from that last photo her conformation seems terrific for such a young foal. I love her mismatched socks. firehorse wrote: The latest pic from her Facebook/Instagram - will she shed out to be dark like mom and dad or will she stay this lighter bay? precious pic! so sweet! thanks for posting it! New photos are up on Z's website. The filly is too adorable for words. ThreeMustangs wrote: New photos are up on Z's website. The filly is too adorable for words. 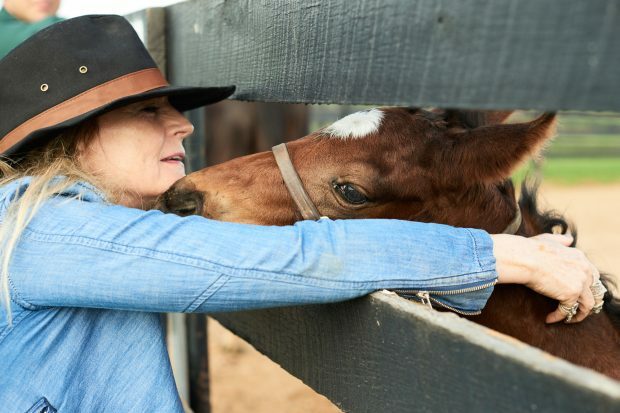 I liked that one too Ridan.... very sweet photo of Ann and the filly - and that little girl running around with those ears straight up.... what a hoot - she is a cutie!! These were posted last Friday, such a lovely filly. and she looks so playful too - very spirited filly - zenyatta has a ton of patience - what a great mom! Zenyatta's filly is adorable and very pretty, but that right front leg looks awfully light in bone. Very slender compared to the left front. For those accustomed to looking at foals, is this just a lighting artifact in two of the photos? Or if that leg really is lighter boned, is that something that will correct itself over time? Like all Zenyatta fans, I'm so hoping this baby grows into a successful racehorse and/or broodmare some day. Thanks Lurkey and Sweettalk. I appreciate your replies and reassurance. That filly is precious in more than one meaning of the word, so I'm glad to know all is well with her. Any ideas if Z was bred this year or given the year off? Who will they choose in 2018? she did get the year off, i'm pretty sure. not sure who her next date will be with though.